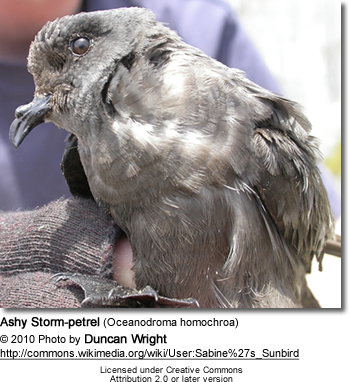 The Ashy Storm-petrel (Oceanodroma homochroa) is a small, scarce seabird of the storm-petrel family Hydrobatidae. It breeds colonially on islands of the coasts of California and Mexico, and is one of 6 species of storm petrel that live and feed in the rich California Current system. Both its common and scientific name come from its colouration, one authority has suggested naming it Coues's Storm Petrel after the man that described the species, Elliott Coues. This is a small, uniformly sooty-brown storm petrel with a forked tail, closely resembling the Black Storm-petrel, however it is smaller and has a more fluttering style of flight, with the upstroke only becoming horizontal to the body before beginning the downstroke (other storm-petrels in its range have a higher upstroke). It is a gregarious bird at sea, feeding nocturnally on cephalopods, fish (particularly the deep sea myctophids, which rise to the sea's surface at night) and euphausiid krill such as Thysanoessa spinifera (which also swarm at the surface). They will also attend fishing vessels for the fish oils released when the nets are pulled. Ashy Storm-petrels nest in rock burrows on offshore islands, returning to the nests at night. The species has a long breeding cycle, laying eggs in May and fledging in October, although timing varies greatly, more so than in most other storm-petrels: some pairs may have a chick that is half grown when other pairs are still laying. Like in many other seabirds, pairs show both mate and site fidelity, mating in the same pair with the same mate for many years and nesting at the same burrow, despite the pairs spending their lives out of the breeding season separate from each other, and despite the fact that many individuals might seem to compete for burrows at the nesting colonies. A change in mate is usually associated with a change in nesting site. The Ashy Storm-petrel is a long-lived bird, a banded individual has been recorded living at least 31 years. Ashy Storm-petrel breeds on 17 islands in the northeast Pacific, principally off California, but also northwestern Mexico. Half the world's population nests on the Farallon Islands, off San Francisco, other breeding islands include the 8 Channel Islands of California (San Miguel Island, Santa Cruz Island, Anacapa Island, Santa Barbara Island, Santa Catalina Island and San Clemente Island), and a small population on Mexico's Coronados. Outside of the breeding season it is believed to be more widely distributed, foraging on the California Current, but undertakes no large migration and doesn't range as far as other species of storm-petrel. In the early fall large flocks can be seen in Monterey Bay. The birds do not range inland by any significant measure except when storm-blown; for example a record for San Mateo County, California was considered "unusual" by an experienced naturalist. The world population is estimated to be around 10,000 birds, 8,000 of them breeders, the Farallon population having declined by one third between 1972 and 1992. The species has recently been listed as endangered and is a species of conservation concern in California. It is threatened by Western Gull and Burrowing Owl predation, illumination from fishing boats, introduced predators such as rats and feral cats, and pollution. Most of the islands that it breeds on are covered by some degree of protection. Global warming and climate change could have a profound impact on the Ashy-Storm petrel. Future changes to coastal California waters due to global warming could result in warmer, less productive waters, which would mean there would be less food available for the petrels. In addition, ocean acidification may result in a decline of crustacean prey species due to the effects that excess CO2 will have on the animals’ shells. Sea-level rise will also threaten certain nesting sites that are located too close to the water.